Performing a periodic financial check is a good thing to do from time to time. It is easy to take things for granted when everything seems to be going well, but it’s those little financial emergencies that tend to cause difficulties. The time that the car breaks down and needs a new transmission or a sudden illness can create havoc with the best financial plan, unless there is a way to plan ahead for it. The very first step is to take stock of what you are spending each month for your needs. Sit down with a pencil and paper, or better yet put all of your information on a spreadsheet on your computer, as it adds and subtracts for you automatically. Find out what the total of your monthly outgo is, then compare it to your total income. This will give you a snapshot of where you are from the basis of your cash flow. Look back through your expenses for the last year. Most people can just go back through their checking account records in order to do this. Look and see if there were any large expenses during that time, and ask yourself if those large expenses are going to occur again this year. Look ahead and determine if there will be any larger, off budget expenses that you will expect occur in the near future. Now, separate the installment debt payments into a separate area, so that they form a group all unto themselves. This will focus your attention on them so you can begin to work in getting them paid off. Set a realistic goal of when you will have them paid off. If you concentrate on this project, you can take the difference in what you were paying on the debts, and put that money into a retirement fund, you can have an extra several hundred thousand dollars at retirement. Play with the numbers a bit, and you will be surprised. Retirement is the next big thing because people are living to older and older ages. The need to be able to fund your retirement well into your nineties is now a reality. If a person retired at age 65, that could mean that they will have to fund their retirement for another 30 or so years after that. Most retirement plans are not built for that, yet it is becoming more of a reality than most people think. The key issues that apply to more current strategies involve tax planning and the focus on keeping your money safe. Even though we are told that inflation is not a current problem, all one has to do is go to the grocery store and see just how prices have gone up over just the past several months. Everything is more costly from grocery prices, gasoline, and everything else. This is why many people are getting second jobs and starting home businesses, simply to keep up. The one weapon that we have is the family budget that we create. Most people don’t have any idea where they spend their money, because they simply don’t keep track of it, and when an emergency strikes, they are left helpless. If you plan for emergencies in your budget, by setting a little bit aside on a regular basis, you have a cushion against such financial surprises. Check your 401(k) or other retirement plans, if you have them. Double check that everything is being credited to you that is supposed to be in your name. Check and be sure that the employer contributions are being correctly attributed to your account. Many employers who sponsor 401(k) plans also contribute matching amounts to your plan. For example, if an employer contributes up to 4% matching what you contribute, that is free money to you, that is tax is deferred, and any interest earned on it is tax deferred as well. Set up a savings account for emergencies. It can be used to cover unexpected expenses such as car malfunctions, deductibles on property and health insurance, school supplies, band uniforms, and a lot of other things that seem to always appear out of nowhere. 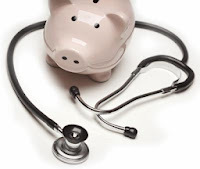 Look into a health savings account for your health insurance. You can purchase a high deductible health insurance plan, and fund the deductible with tax-deferred dollars. If you don’t use the health insurance, you can continue to fund the plan each year. For example, let’s say that you purchase a plan with a $5,000 deductible. That one deductible covers the whole family. The first year, you deposit $5,000 into the savings portion of the plan. It will earn a little interest, but now you really have a health insurance plan that will cover the family for 100% of all medical expenses. Each year you put in another $5,000, and in four years, for example, there is $20,000 in the plan. You can use any leftover money for your retirement when that time comes.